As the 2012 edition of the Stanley Cup Playoffs begin this week with the conference quarterfinals, thoughts of hockey pundits immediately go towards upsets and sweeps. Given that the entire point of the regular season is to seed the playoffs, whenever upsets and sweeps occur, the question arises: do the seedings really make a difference? 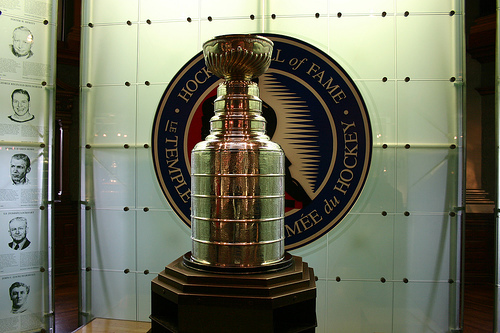 With the league’s expansion to 30 teams, the National Hockey League adopted its current playoff system beginning with the 1999 post-season. The best teams play the worst teams in each round, so one would expect the most upsets in the first round – given the most potential disparity between the better and worse teams. Based on winning percentage alone, it appears that #4 seeds are over-achieving relative to the other “higher” seeds in each first-round pairing. There have been 15 four-game sweeps since the NHL instituted the present playoff system in 1999. All things being equal, one would expect the best teams to more frequently sweep the worst teams. But that’s not the case here. The #3 seed sweeping #6 is the most common, followed by two occurrences that are equally common: #7 over #2 and #1 over #8. #7 over #2 itself is very confusing, as the average series has a fairly distinct and significant points differential – the average #2 seed is much, much better than the average #7. POINT DIFFERENTIALS: DO THEY MATTER? All of this begs a question regarding playoff seeding. Does it really matter? The average #1 vs. #8 series features a regular season points differential of 21.4 points, and the series is most commonly won by the better team. But looking at the playoff match-ups in the opening round since 1999, the #2, #3 and #4 seeds generally won the same number of series, even though the #2 seed on average had THREE TIMES the points differential of the #4 seed. In other words, the “average” opponent that the #2 seed faced has been consistent and significantly worse than those faced by the #3 and #4 teams, but they all win at approximately the same rate. There are several possible explanations for this: Higher seeds becoming complacent, lower seeds being used to playing play-off style hockey in order to qualify. Or perhaps the recent phenomenon of three-point games (via shootouts and overtimes) have resulted in a complete skewing of the data, resulting in actual NHL parity being camouflaged by extra points that turn lower seeds into higher seeds without really altering their talent levels. Either way, the Stanley Cup Playoffs have been a wild, albeit somewhat predictable ride, during the opening rounds. Now it’s just a question of if these patterns will hold throughout this year’s post-season, or if trends will be bucked.